Safe Landings: large site-specific installation at Barka Fort, Oman. Interview with the artist. Radhika Khimji was born in Muscat, Oman in 1979. After completing her BFA at the Slade School of Fine Art in London, she did post-graduate studies at the Royal Academy of Fine Arts, and a second Masters in History of Art at University College London. Her most recent exhibitions include a solo show at Bose Pacia in New York and group exhibitions at the Saatchi Gallery and Iniva in London. Safe Landings was Radhika Khimji's first solo exhibition in Oman. From 22 - 28 March 2010, she presented a large site-specific installation of her Shifters at Barka Fort. Haupt & Binder: You have been working for some time now on a series of anthropomorphic cut-outs, in-between painting and sculpture, that you call "Shifters", how did you start with them, and how do they relate to your former work and your general ideas? Radhika Khimji: In 2002 I began making a series of large scale collages which were assembled out of fragmented body parts. They were always descriptions of the body in movement and investigations into a making process. The Shifters were the next logical step from these assemblages. No longer limited by their rectangular frames, they are stripped of backgrounds and contexts. These cut-out anthropomorphic shapes now interact with the sites they are placed in, to forge new relationships. Formally, they exist in a place between painting, sculpture, and drawing. The Shifters teeter on a place of near recognition as abstract bodies, sitting, standing or leaning. Haupt & Binder: The figures seem to be armless and faceless, some observers may interpret that they are mute or have even been "censored," but from what we have seen, they are playful and lighthearted, or have an assertive determination. Are there also other, for example, suffering or rebellious Shifters? Radhika Khimji: The Shifters have different characteristics, and perform different gestures, no two are the same, and yes they can be playful and lighthearted. For me, this is what makes them so interesting, and stimulating, because they are slightly larger than life and can be menacing because of this. There is a self imposed censorship, as I have been working on pushing these pieces beyond cultural illustration, to sit outside the lines of Orientalism. I have found a language which plays with and dodges a cultural net which would make these figures easily understood and read. That's also why Barka Fort became such an important site for me to show them. A lot of my research has had to do with depictions of the body as "other", as a cultural commodity. So, using a site which is a touristic place in Oman was really important to see if I could push the boundaries of categorization here as well. 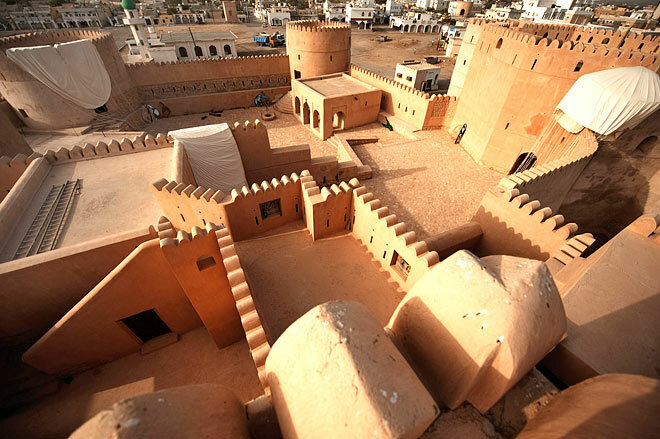 Haupt & Binder: Safe Landings is your first exhibition in your home country Oman, tell us more about why did you choose Barka Fort for your show. Radhika Khimji: Barka Fort is a really special site, and I have been thinking for some time about heritage spaces in Oman and what they mean today. Barka was once a strategic trade capital in the late 18th century. In an effort to prevent harassment in Omani waters, the ruling Sultan handed over the use of Muscat's port to the Persians and moved to the town of Barka. Ultimately, as major trade routes were redirected to pass through this town, the move enabled the Omanis to regain full control of Muscat. By changing trade routes, the Omanis were thus able to preserve their position with dignity and strength. The displacement of the port from one place to another, for a short period of time, created a sense of hovering between two places. I found this narrative really empowering when I read it and thought it was a different take on displacement as the interim period did not disorientate the people's identity. Haupt & Binder: You decided to include parachutes in your installation at Barka Fort, how do they interact with the Shifters and the place? Radhika Khimji: The parachutes added a second narrative layer to the cut outs. The Shifters and parachutes together were made to interact with the history of the site as well as the structure of the fort, in order to define an uncertain existence. In setting up this visual and architectural apparatus, I wanted to reconsider the terms "displacement" and "embodiment" anew, and what it means for a work of art to encapsulate both states of being.